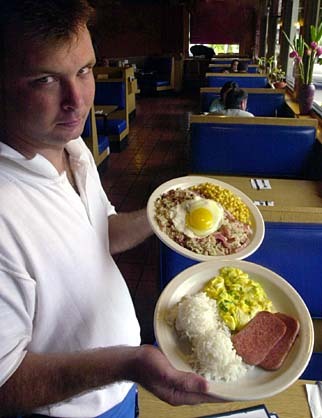 Waiter Chris Huff holds up two versions of KC Drive Inn's popular Spam plates. The dish in foreground consists of Spam, eggs and two scoops of rice, and the dish in back is a generous portion of fried rice and Spam with an egg on top. Both entrees cost less than $6. Spam, made by Austin, Minn.-based Hormel Foods Corp., has been Hawaii's undisputed king of canned luncheon meat since it was first introduced to the islands during World War II. HONOLULU >> Not since the overthrow of Hawaii's last queen has a foreigner dared to wage a battle so fierce against an island institution. 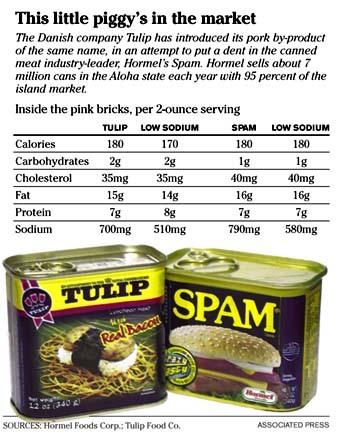 Spam has been Hawaii's undisputed king of canned luncheon meat since the curious, gelatinous, pink, pork brick was first introduced to the islands during World War II. But now a new Danish copycat called Tulip is trying to unseat Spam from its throne. In Hawaii, Spam is much more than a four-letter word for unwanted e-mail. The product made by Austin, Minn.-based Hormel Foods Corp. isn't just another canned meat either. It's more of a staple food and part of island culture. Hawaii leads the nation in per capita Spam consumption. After two years of planning and development Tulip was introduced in Hawaii last August with an aggressive marketing campaign and an ambitious goal of gaining about 20 percent of Spam's enviable market share in two years. Tulip's distributor and marketer, Advantage Webco Dodge Hawaii, said sales have been strong. Its marketing goal of selling 1.2 million cans may be met a year earlier than expected, the company said. "Surprised? Oh yeah, because you just can't just challenge the big boy and expect to do that well in the first year," said Percy Higashi, Webco's vice president. But Higashi acknowledges putting a major dent in Spam will be a challenge. "I don't think anyone has been successful against Hormel in Hawaii," he said. Hawaii residents consume nearly 7 million cans of Spam a year, an average of about six cans for every man, woman and child. McDonald's in Hawaii serves Spam for breakfast. Spam "musubi" -- a slice of Spam atop a slab of rice and wrapped in seaweed -- is an island favorite sold at nearly every convenience store, including 7-Eleven. Spam fried rice is a local classic. In fact, it's hard to find a cupboard in Hawaii that doesn't have a couple of cans of Spam. It's one of three necessities -- the others are toilet paper and rice -- that people stock up on whenever there's a threat of a hurricane or dock workers strike. "It's everywhere in Hawaii," Nick Meyer, senior brand manager for Spam. Some consumers said they're willing to try Tulip, but they'd have a hard time giving up Spam. "I would buy Tulip, but we're so used to buying Spam," said Richard Shimabukuro, of Waipahu, who said Tulip tasted similar to Spam, but seemed to be less salty. "We've been eating it all our lives." Meyer said Spam, which owns about 95 percent of the Hawaii market, welcomes its new competitor. Tulip, which isn't available outside Hawaii, was created specifically for the Hawaii consumer. The product by Tulip Food Co. is made partly from bacon and features a musubi on its packaging. "The introduction of bacon is what really set this product apart for us because local people like bacon," Higashi said. "I don't know if it's flattery, but we just noticed Hormel has just introduced a Spam with bacon." Hormel, which makes Black Label Bacon, is introducing a Spam with bacon in April. It will be first sold in Hawaii before it is introduced in other markets, Meyer said. But Higashi said it isn't just coincidence that Hormel's Spammobile recently visited Hawaii for the first time. The biggest shock for Higashi was when Spam came out with its own Hawaii collector's can featuring a picture of a musubi in August 2003, the same month Tulip came out after two years of focus groups. "When we saw the other can pop up, we knew they wanted Tulip to go away," Higashi said. "I think we're flattered because things that never happened in the Hawaii marketplace is starting to happen." Meyer said the Spammobile's visit, the new bacon product and the Spam Hawaii can all have been in the works for a long time -- and are not in response to Tulip. At Times Supermarkets' 12 locations, purchasing director Ed Vargas said Tulip sales are better than he expected. "I think Tulip has done a good job in trying to take market share, and they have taken some from Spam," he said. Foodland, which operates 29 stores statewide, wouldn't disclose sales figures but said Spam is still the leader. "Tulip sales are very favorable," Foodland spokeswoman Cheryl Toda said. "Although we don't sell as many cans of Tulip as Spam, more and more customers are purchasing this product and enjoy having an alternative to Spam." Besides Tulip, there are also about half a dozen other luncheon meats on the market including Treet, Celebrity and some generic brands. Others, too, have come and gone, but Spam still reigns. Spam doesn't seem too worried about Tulip. "It's not to say they'll never have a big share in the market, but right now, my bigger competitors are Portuguese sausage, deli meats and bacon," Meyer said. "Quite frankly, it's not Tulip. "In the end, the best product is going to win," he said.